(click all pictures to make bigger) I have been going to military balls for the past 15 years and understand all the intricacies, traditions and formalities that are unique to them (party shirt, punch ceremonies, loading your purse with things before you go so you can win stuff etc…). This Mardi Gras ball thing is still completely foreign to me. I will explain the best I can to you about what takes place at a ball. I know I don’t understand the hierarchy of the Krewe in the least bit nor do I understand the royalty (big L on forehead). So I guess you can consider anything I write as pure observation from a newbie. Last night I attended my second Mardi Gras Ball. We went to the Bacchus Ball last year and after watching the parade go by us in the Civic Center, we ate, drank, danced and went home. If there was other stuff going on- clueless. Last night we went to the Original Krewe of Oprheus Coronation Ball in Mandeville. My hubby is riding in the parade this year for the first time. Kevin Flockton, the President of Orpheus, also happens to be our neighbor and is a Masshole like us. He thought is was “wicked” cool to invite hubby to ride as soon as he saw him jog past his house in a Patriots shirt. (this is a picture of me and Kevin). * there was a buffet line and we quickly hit it. There was mixed vegetables, bow tie pasta with shrimp, crawfish and green onion wrapped en papillote (called a crawfish sack), gumbo, meat and bread. Everything was absolutely delicious. * all I could think of is that in 12 years, I could see my daughter in one of those white dresses and of course, wearing a sparkly tiara. * I have a feeling we will stick with this Krewe forever – hubby is hooked! 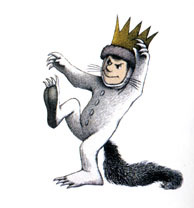 Sorry (don;t be mad at me), but I kept having visions of Max from “Where the Wild things are” in my head all night (maybe Sendak got his illustration inspiration from the Mardi Gras King)? You look lovely, Greta! So glad that you had a fabulous time. What fun getting to learn a whole new culture! Thanks for the play-by-play and the peek inside! That sounds like SO MUCH FUN!!!! Like everyone else has said, You. Look. Gorgeous! Your husband looks dashing and the whole thing looks like a blast! I hope your innards are healing up and you didn’t set yourself back TOO far with this night of fun! HAIL Where the Wild Things are! Your gown is gorgeous. That’s your handsome hubby? Glad you’re there, and letting others here know about all the goings on. Greta, you look just beautiful & radiant, & Brett looks so handsome. So glad you went to that ball. Sounds like you both had a great time. Wish I had been there to see you both & of course take more pictures. What a gorgeous couple you make. So proud of you both! !